Sandos Finisterra places 4th in sales among Expedia Los Cabos all inclusive resorts! On Thursday August 14, our resort hosted the Partner Appreciation Cocktail Party, an event designed to recognize the 5 best-selling European Plan and All Inclusive Los Cabos hotels on the travel site Expedia.com. We welcomed about 150 guests, including numerous personalities and hotel industry executives like Pablo Castro (Director for Expedia Latin America) and Marco Tagliatti (Vice President of Product for Expedia Latin America). Sandos Finisterra Los Cabos was honored to receive 4th place in sales for 2013 in the Los Cabos all inclusive hotel category. 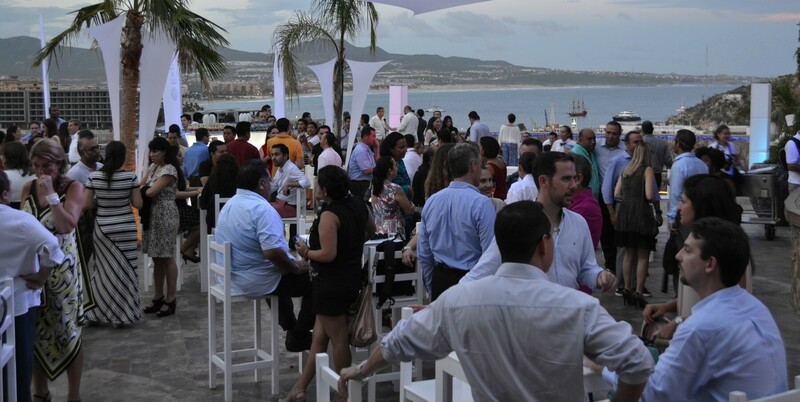 The Expedia event took place on our lovely Plaza Finisterra, a large terrace designed for hosting unforgettable outdoor events with panoramic views of Cabo San Lucas Bay and the city skyline. Plaza Finisterra has its own stage for live shows, in addition to an impressive clifftop location that’s just perfect for enjoying the famous sunsets of Cabo San Lucas. During the cocktail party, our guests had the chance to enjoy live jazz music and elegant hors d’oeuvres like petit fours and delicious cupcakes. Our Sandos Finisterra bartenders also prepared several original cocktails for our event guests, including flavored martinis and artisanal margaritas. 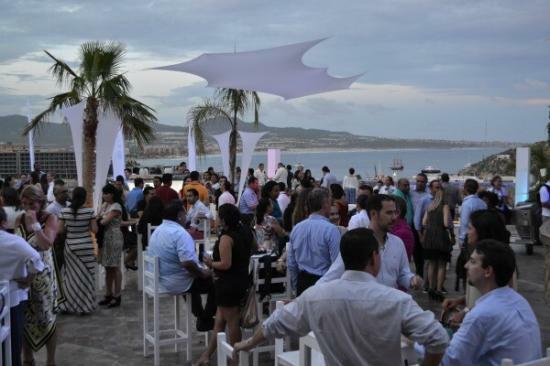 At this event, Expedia also took the opportunity to recognize its Insiders Select properties in Los Cabos, which includes only 650 hotels from all over the world every year. 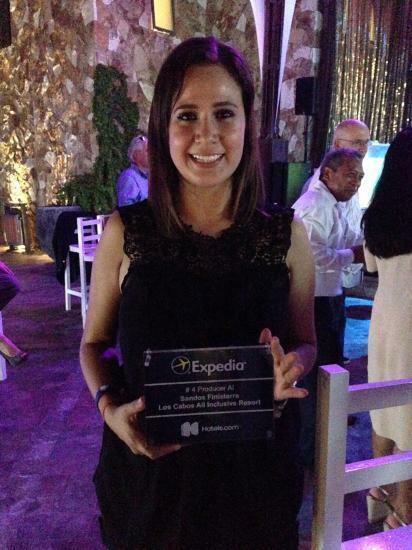 In 2014, Expedia recognized seven hotels in the destination of Los Cabos, Mexico, and these awards were handed out at the Sandos Finisterra Los Cabos cocktail party. This elegant cocktail event was a big hit with Expedia’s guests thanks to the excellent service provided by the Sandos staff and the incredible atmosphere of our Plaza Finisterra. 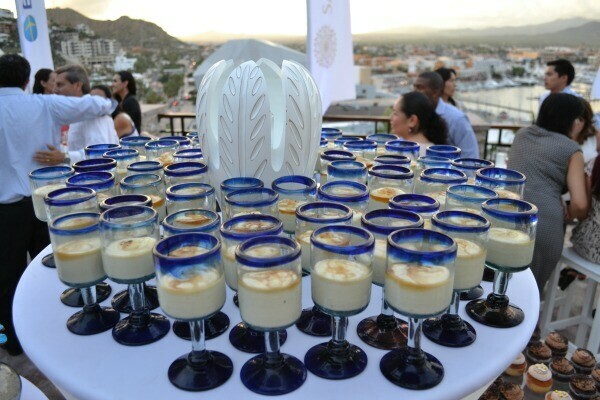 We were honored to have the chance to support Expedia in recognizing the excellent hotels of Los Cabos; this Mexico destination is known for its stunning golden beaches, its unforgettable water activities like fishing and diving, its lively nightlife and its colorful shopping experiences. Sandos Finisterra Los Cabos offers an unbeatable location in the exciting downtown area of Cabo San Lucas, with the famous Cabo San Lucas marina just steps away from our resort. We also have a refreshing beachside pool area with three lovely swimming pools and a swim-up bar, a great way to have fun and relax throughout your Los Cabos vacation. Our guests also love our complete all inclusive plan, which includes all of your food and beverages during your stay at the hotel, in addition to a variety of amazing restaurants and bars to choose from. Sandos Finisterra Los Cabos resort is surrounded by jaw dropping scenery like an immense beach by the Pacific Ocean and panoramic views of the bay and the city of Cabo San Lucas. Thanks to our great location, we’re the ideal place to host an unforgettable group event, business getaway or romantic wedding. Surprise your guests with a cocktail party like this one at our Plaza Finisterra. You and your guests will be blown away by our delicious cuisine, refreshing cocktails and amazing views! For more pictures of our beautiful Expedia cocktail party, click through to our Facebook album. ← Which resort is best for your summer vacation?